My third DB challenge and what a surprise! 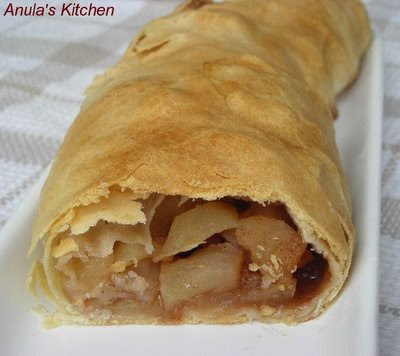 An Apple Strudel. Always wanted to make it but never had the guts ;) That's also what Daring Bakers are - they challenge you to get out of the comfort zone, but if you need them - they are there for you, to advise, reccomend, help and also admire your finished work (doesn't matter if it was horrible, effort is the most important thing!). It's à la Chinese style as I believe that if a Chinese person/chef/or anyone who is actually interested in Chinese cuisine see that... they will tell me that this has nothing to do with real Chinese food. It's only my interpretation. So please look at it with a bit of 'reserve' ;) I like real Chinese food, the one I'm getting from a chef who knows how and what to do. 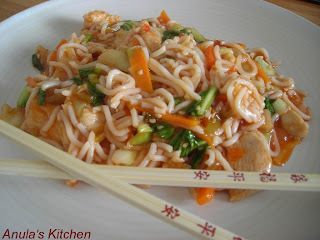 Sometimes I want something similar, with a bit of that unusual taste... and that's when I prepare dish like this. It's very quick and simple, just remember to have everything chopped/diced and ready before you start frying. So we are starting The Daring Cooks. I'm so happy that besides baking we know have challenges regarding cooking. The first one was Gnocchi, not the ordinary one but from home made ricotta. The recipe has been chosen from the cookbook by Judy Rodgers "The Zuni Café Cookbook" - Zuni Ricotta Gnocchi. I couldn't wait to make this recipe as I LOVE gnocchi but I have never made my own... I always thought that gnocchi are made mainly from potatoes but... in this recipe they are substituted by ricotta which is a great idea! This shows that with Daring Kitchen we not only bake/cook but learn new skills and recipes. I've made my own ricotta (the recipe for ricotta was posted on the 21st April). It was way cheaper than buying ricotta and was SO easy! I will definitely make ricotta more often. 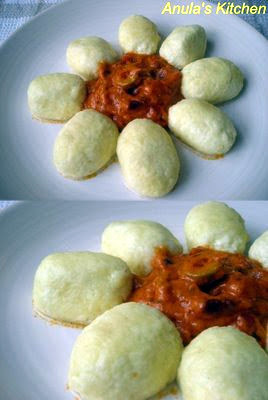 I served my gnocchi with sun dried tomato, green olives and mascarpone sauce. I had some more gnocchi left for the next day - they were fried - yummy! It was a pure coincidence that I've made this dish... I saw those beautiful, big mushrooms and just had to buy them! I love goat's cheese so I decided to combine both. The result was great! It's very easy and quick dish. I could even say that basically no cooking is involved - as you just have to slice, cut everything, arrange together and put into the oven - done! I used a tomato and courgette to make it rich and to add extra taste, but I would say you can add any vegetables you actually have in your fridge. Also an egg and oil of olives will be handy ;) It will be great as a starter (one mushroom will be plenty) or as a main dish served with a selection of bread. 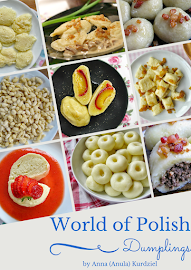 I've missed this kind of food... As I had lots of Silesian dumplings (recipe published on the 4th May 09) I thought I'll just make a dinner from my childhood. It's what we call traditional, Silesian, Sunday dinner. I had to adjust my version a little though. 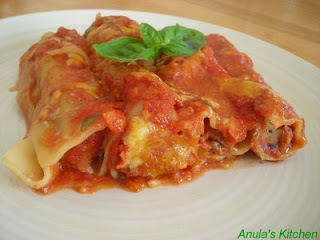 The roulades should be from beef not chicken and you should make the sauce yourself - from the meat juice which remains after cooking the roulades. It was a real 'time machine', almost like home. Hope you will make it someday and try it for yourself :) It's not difficult but it's a little time consuming. Roulades like that can be a great idea for a party dinner (of course if you don't have to many guests) and you just need a good sauce and some salad to accompany them. Use meat tenderiser and flatten the chicken breasts. Spread a thin layer of Dijon mustard over the chicken, put thinly sliced garlic and 1 bacon rash on each breast. On one end of each breast put few bits of onion and cucumber. Roll the chicken tightly. Wrap each breast into slice of bacon. Take a theread or thin string and 'tie' the roulades - or they will disintegrade when frying. Fry for about 25 min. - don't forget to get rid of the string before serving! ;) Cook the dumplings and make the sauce as per instructions (or make your own). On the plate arrange dumplings, roulade and red cabbage. Pour the sauce over the meat and Silesian dumplings. Serve immediately. Those are my favourite! 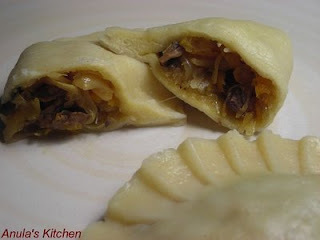 As I'm from that part of Poland (actually from the very capital of Silesia - Katowice) those dumplings are no stranger to me ;) They are part of Silesian, traditional Sunday dinner which consists of: dumplings, red cabbage and roulades (stuffed with sausage, some pickles, onion) with a gravy. Oh, how I miss those family dinners... I don't make those dumplings very often, as I prefer to make them once in a time, but a huge amount of it and just freeze portions ready to be cooked. 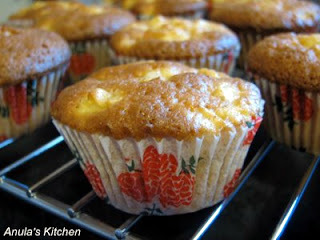 The recipe isn't complicated and I highly recommend to try them. They are great with some savoury meat sauce, mushroom sauce or goulash. Yesterday, after a huge dinner (Stuffed Cannelloni) my Hubby 'demanded' the dessert... I was surprised he had a place...! 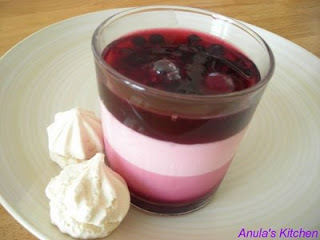 So to not make the same mistake twice I made a dessert today :) Altogether I had 4 portions - so we can have it 2 days in a row. 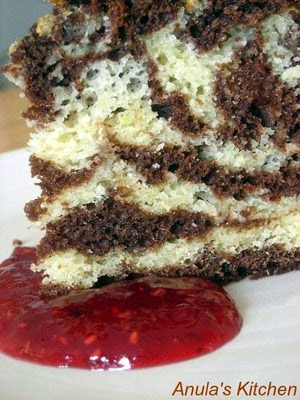 It's simple, delicious, but you have to make it in 'stages'. Trust me - the end result is so worth your effort. Another dish from my chicken... We had already 3 dinners from that 'little fella' and I have still a breast and 2 legs in the freezer! That's what I call budgeting in the kitchen :) especially know when we have 'recession' all around us... Back to the vegetable soup. Remember that broth from yesterday? We had so much of it, that my Hubby decided to make a vegetable soup. He took the broth and added some frozen cauliflower and broccoli. 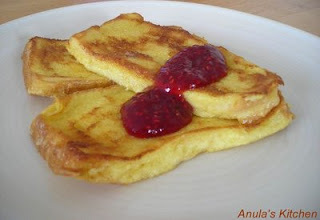 It's easy, cheap and what's the most important thing - delicious :) I had it with toasted roll and I also put some cream into it... yum!